According to agency officials, the Department of Energy (DOE) is considering a new rail route for the transportation of nuclear waste to the proposed Yucca Mountain repository. DOE had earlier designated a different route – the Caliente corridor – as its preferred rail alternative. 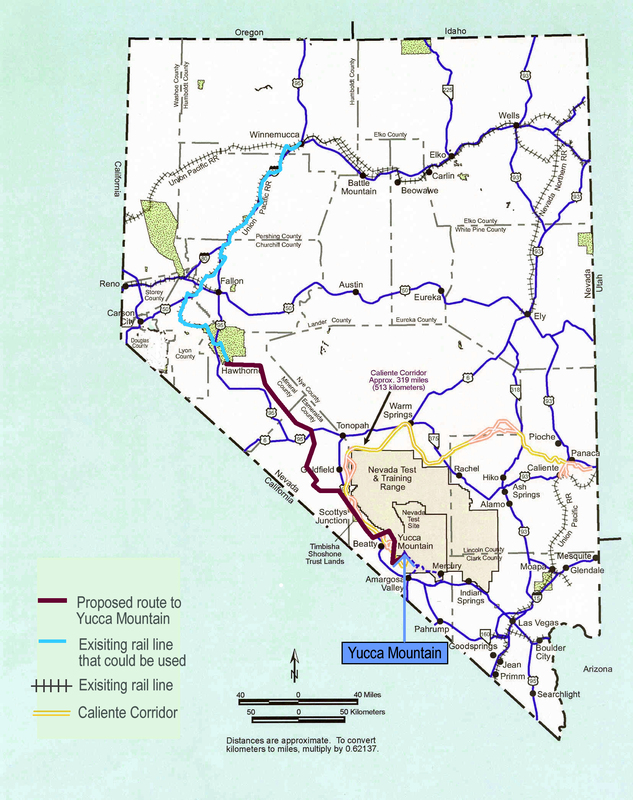 The route in question would run through the western part of Nevada along the Union Pacific Railroad track south of Winnemucca. 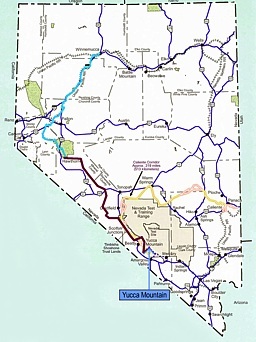 West of Fallon, the route would use an existing southbound spur which cuts through the Walker River Indian Reservation to Hawthorne. From there a rail line would be built along a rail bed abandoned by the Southern Pacific Railroad to about five miles north of the town of Mina. The rail line construction would then continue south near Tonopah and then run along the edge of the Nellis Air Force Range to the site of the proposed repository. DOE had previously considered the so-called Mina route in the 1980s and early 1990s, but shelved plans for further study of the corridor when the Walker River Paiute Tribe informed the department that it would not allow high-level radioactive waste to be shipped through its reservation. However, the tribe reversed its earlier decision in April, stating that it will allow DOE to consider a rail route across its land. The tribe’s decision has prompted DOE to reopen its study of the route, despite the fact that the agency designated a different route as its preferred rail line corridor several years ago. In 2003, after studying five proposed rail corridors in its Environmental Impact Statement for the Yucca Mountain Project, DOE named the Caliente route as its preference for construction of a rail line. The Carlin route, which cuts through a portion of Eureka County, was designated the secondary preferred corridor. The Caliente route was originally chosen for its remote location and reduced likelihood of land use conflicts. The corridor is already under study through an official environmental impact statement. However, cost estimates for the construction of the 319-mile rail line, which would begin in Caliente in the southeastern part of Nevada, have skyrocketed. This past fall, DOE revised its initial $880 million cost estimate for the Cali-ente route. The agency now believes the construction of the route could cost up to $2 billion. Some transportation experts believe that the Mina route would be less expensive and faster to build than a rail line in the Caliente corridor. DOE could make use of rail alignments that exist where trains once served a booming mining industry. Additionally, the portion of the rail line to be constructed South of Hawthorne would only have to be 209 miles long, as opposed to the 319 miles of new rail construction that the Caliente route would require. However, while more inexpensive to construct, the Mina route would lead to trains crossing through a larger portion of Nevada. Nuclear waste shipped by rail from the eastern states would cut through Eureka County on the Union Pacific Railroad tracks that run through the northern part of the county. Trains carrying nuclear waste may also come within a close vicinity of Reno and communities in fast growing Lyon and Churchill counties. The proposed route would include a new rail line on the outskirts of Paiute reservation land north of Walker Lake which would bypass the community of Schurz. The department is currently updating data it collected on existing rail alignments 20 years ago in order to decide whether the Mina corridor is worth further investigation. DOE must also review the status of mining claims and land use ownership in the area. DOE is in the process of determining whether the Caliente environmental impact statement study underway can legally be expanded to also include the Mina corridor. The department hopes to have a decision on whether to go forward with studies on the Mina route by the end of the summer. An analysis of the Mina option could add between eight months to a year onto the current rail corridor study, which has already experienced delays. The Department of Energy (DOE) has set a new target date for the opening of the proposed Yucca Mountain repository. According to a July 18 announcement, Yucca Mountain will be ready to start accepting shipments of nuclear waste in March of 2017. This is the first timeline DOE has set for the repository since it abandoned its previous deadline of 2010 two years ago. During the early phases of the project, DOE projected that the repository would be ready to begin operations as soon as 1998. However, due to budget shortfalls and various scientific, legal, and regulatory obstacles, the repository project has fallen significantly behind that original target date. This new schedule foresees the repository opening 19 years later than planned at the outset of the project. Under the revised schedule, DOE expects to submit a license application to the Nuclear Regulatory Commission (NRC) by June 30, 2008. The Yucca Mountain site must be granted a license by NRC before DOE can move forward with the construction and operation of the proposed facility. NRC is a federal agency that regulates all of the nation’s nuclear facilities, with the exception of the nuclear weapons complex. The license application was originally slated to be submitted to NRC in December of 2004. This is the third time DOE has moved back the target submission date. One issue that must be resolved before DOE can submit the license application is the preparation and release of research documents. Under NRC rules, DOE cannot file the application until six months after it has publicly released all background documents supporting its license application. The documents must be prepared electronically and released on an internet database known as the Licensing Support Network. DOE is in the process of cataloging millions of emails and documents to be posted to the network. Once DOE submits the license application to NRC, the commission will have three years with a possible one-year extension to review all of the material before deciding whether to grant a license for the construction and operation of a repository at Yucca Mountain. Under the new schedule, the energy department could have approval to go ahead and begin construction of the repository by 2011. Under the new plan, construction of a rail line to transport nuclear waste through Nevada would begin in October of 2009, two years before NRC gives DOE permission to build the repository. DOE anticipates that the rail line would be in service five years later, in June of 2014. Construction on the actual repository would be completed by March of 2016. The facility would then go through pre-operational testing and be ready to start receiving nuclear waste in March of 2017. This new deadline depends on the successful resolution of a number of political, financial, and legal obstacles that have stymied progress on the project. For instance, the revised schedule rests partly on the assumption that Congress will appropriate an adequate level of funding to meet the project’s needs each year. DOE also assumes that NRC will complete its review of the license application within three years. Nevada Representative Shelley Berkley (D) was critical of the new timeline, calling it “overly optimistic.” According to Berkley, this new schedule “could easily be derailed by a court ruling or act of Congress.” Edward F. “Ward” Sproat, director of DOE’s Office of Civilian Radioactive Waste Management, commented to reporters following the announcement of the revised schedule. “I’m not saying it can’t be done, but it’s going to be a challenge,” he said. Sproat added that the department would not be able to meet the new deadline unless Congress passes a series of legislative reforms for the program contained in the “Nuclear Fuel Management and Disposal Act,” which is currently under debate in the Senate. The Bush administration has proposed an initiative aimed at expanding the use of nuclear power both in the United States and abroad. Called the Global Nuclear Energy Partnership, or GNEP, the initiative envisions cooperation among the United States and other nations to develop and perfect the technology needed to reprocess spent nuclear fuel. The budget proposed by the administration this year contains $250 million to initiate the partnership. The United States had previously pursued reprocessing as a solution to the problem of nuclear waste, but abandoned the technology in the 1970s. At that time reprocessing technologies recycled nuclear waste into reusable fuel, but also created plutonium as a byproduct. Because plutonium can be used to build nuclear weapons, reprocessing was seen as a security threat. President Carter banned the technology in 1977 due to proliferation concerns. The ban on reprocessing was lifted by President Reagan in 1981, but due the cost and technological complexity of the process, no company in the United States has since tried to develop it. The GNEP initiative is intended to spur the development of new technology that would reduce the volume of spent nuclear fuel without creating dangerous, weapons-grade by-products. Under GNEP, nuclear nations such as Russia, France, and Great Britain would work together to develop this new technology. According to the proposal, nuclear reactors would be sold to smaller nations. The fuel for these reactors would be leased to the small countries and then taken back by GNEP’s participant nations for reprocessing and disposal. DOE officials contend that reprocessing would reduce the volume and toxicity of spent nuclear fuel, perhaps negating the need for further repositories in the United States. The reprocessing would still create radioactive byproducts, however, which would eventually be buried at a repository. The $250 million requested for GNEP was recently approved by the Senate Appropriations Committee. A similar bill passed by the House in May cut GNEP spending to $120 million. The two bills will be reconciled in a conference committee later this year. The Senate has confirmed the Bush administration’s nominee to head the Yucca Mountain project. Edward F. “Ward” Sproat will direct the Energy Department’s Office of Civilian Radioactive Waste Management (OCRWM), which oversees the development and implementation of the country’s nuclear waste disposal program. OCRWM’s responsibilities include advising the Energy Secretary on the scientific research and licensing of the proposed repository. OCRWM also oversees the development of a national system to transport nuclear waste to the repository. Sproat, a nuclear industry executive, was a managing partner of McNeil, Sproat & Associates, a consulting firm based in Pennsylvania. He held executive posts at Exelon Corp, the country’s largest nuclear operator and PECO Energy. Sproat replaces Margaret Chu, who resigned as OCRWM director in February of 2005. Sproat, who is the sixth director to lead the program since its creation in 1983, testified before Congress for the first time on July 19. The Bush Administration unveiled its plan for the Yucca Mountain in April with legislation that would speed up the licensing process and other components of the repository project. The “Nuclear Fuel Management and Disposal Act” seeks to strengthen the Department of Energy’s authority over planning for the repository while at the same time expediting hearings that will be held by the Nuclear Regulatory Commission (NRC) to license the facility. The bill is currently stalled in the Senate committee on energy and natural resources. Eliminate the existing 70,000 metric ton cap on Yucca Mountain's storage capacity. The bill would raise thecap to 120,000 metric tons. Permanently withdraw from public use the 147,000 acres of land surrounding the Yucca Mountain site. Guarantee that money in the Nuclear Waste Fund, which is paid for by consumers of nuclear energy, would be used solely for the Yucca Mountain Project. Give the federal government authority to pre-empt state transportation laws. The bill contains many provisions sought by proponents of the Yucca Mountain Project such as the nuclear power industry. For example, the bill seeks to change the limit on the capacity of the repository. Under current law, the amount of waste stored at the proposed facility cannot exceed 70,000 metric tons. If passed, the bill would raise the legal capacity of the repository to 120,000 metric tons of nuclear waste. Energy Secretary Samuel Bodman explained the need to change the 70,000 ton limit in a letter to Congress that accompanied the bill. “Repeal of the limit would postpone indefinitely the need for the department to begin a second repository siting and development effort,” he said. With nearly 55,000 tons of spent fuel currently being stored onsite in nuclear power plants, it is possible that additional waste repositories would be needed in the foreseeable future if the limit on Yucca Mountain is not lifted. The bill would also authorize DOE to begin building a rail line to transport nuclear waste before the agency obtains a license from the NRC to build the repository. However, despite numerous provisions that could speed up the project, the bill does not address key elements that may be necessary to move the project along. The bill does not authorize temporary storage for nuclear waste while the repository is being built (see section below for more information). It also fails to address the issue of nuclear waste recycling, a favorite issue of Senator Pete Domenici (R-New Mexico). Domenici is chairman of the Senate committee on energy and natural resources, where the bill is currently stalled. 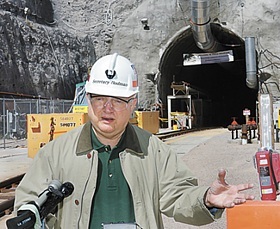 Energy Secretary Samuel Bodman talked about the bill during his tour of the Yucca Mountain facility in April. “The legislation will allow us to provide stability, provide clarity, as well as predictability to the Yucca Mountain Project,” he said. Bodman also commented that the bill would “help lay a solid foundation for America’s future energy security.” Representative Joe Barton (R-Texas) indicted in July that the House may consider a similar bill during a lame duck session later this year. Energy Secretary Samuel Bodman commented on pending legislation following his tour of the Yucca Mountain facility in April. In order to address the failure of the Nuclear Fuel Management and Disposal Act to provide for interim storage of the nation’s nuclear waste, a new provision has been crafted by Senators Domenici and Reid. Attached as a provision to the fiscal 2007 appropriations bill, the measure would provide $494 million to fund the Yucca Mountain Project. This amount includes $10 million for the development of interim storage facilities. The bill was approved in June by the Senate’s appropriations subcommittee on energy and water development. If the bill were to go into effect, individual states would be involved in selecting the sites for the interim storage facilities. The facilities would be licensed for 25 years and could open as soon as 2011 or 2012. States could also decide to keep the fuel onsite at nuclear power plants rather than build separate temporary storage facilities. “States are going to find the best site within the state,” said Domenici. “They may decide to leave it where it is.” According to Senator Reid, the measure is “Yucca-neutral,” and would allow time for the development of possible alternatives to the proposed repository. “This measure will give us time to study the problem of nuclear waste and work towards a solution that is safe and viable,” Reid said. The measure has been approved by the Senate subcommittee but has yet to go to the full Senate. Radiation Standard for Yucca Mountain Expected by End of This Year…. The Environmental Protection Agency (EPA) expects to finalize a radiation standard by the end of 2006, according to an agency representative. The Eureka County Nuclear Waste Update is published by the Eureka County Yucca Mountain Information Office, P.O. Box 990, Eureka, NV 89316, (775) 237-5707. The purpose of the Update is to provide information to the public about issues related to the proposed nuclear waste repository at Yucca Mountain. The newsletter is funded by a direct payment to Eureka County from the U.S. Department of Energy. Articles in this newsletter may not necessarily reflect the positions or opinions of the Eureka County Board of Commissioners.